It is pretty amazing to watch and learn how we and old time racing are conditioned to think, versus other gambling companies. We have been reading on the Paulick Report much of the racing lament - our game is expensive, how will we pay for things if we cut takeout? Saying "increase volume as your price finds the right spot" does not resonate well. We are dealing with a business who never had to change. Mr. Pope…..You have convinced me that takeout doesn’t matter and owners need more money to grow the sport. I propose raising the takeout rate to 45% on all bets. Give 15% to the owners, 15% to the host track and 15% to the bet taker. Facetious of course, but hey: don't give them any ideas! Flipping over across the pond I was doing some reading on Betfair, who is the world leader in horse wagering and is contributing piles of money to the game in the UK. They have 30% year over year sales growth, and now handle more bets in a minute than the European stock exchanges combined. This is their answer in their annual review to a question asking about why they charge so low a takeout (their takeout is less than 5%) and if they are leaving money on the table with it that low. Not at all. Betfair is a business, not a charity. We set margin at the level where we believe we maximise profit, taking into account the behaviour of customers and the overall marketplace. In the past, local bookmakers could set any price and get business, because they were the customer’s only option. But as an internet betting company in the 21st century, our marketplace is the competitive global village, and customers can shop anywhere they want. So price is set to maximise take. Compare that to the comments on the Paulick Report and it should be readily apparent just how differently our business thinks. Something as simple as setting a price to maximize profits seems to be a foreign concept in North American racing. If you want us help drag our butts into the century and make a difference, please sign up for HANA. If you do your homework this weekend - we need all the help we can get! 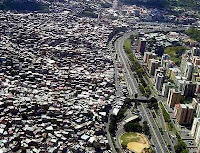 The photo in our piece is of Caracas Venezuela. One side prosperity, the other none. Please help us get on the right side of the highway. Everyone knows that betting exchanges are better models than pari-mutuel. It's the fear of change that is holding the industry back. Someday, when racing is dead in this country, there will be nothing left to fear. We should highlight the positive and negative bets in Horseracing.These should be Highly visable on every Blog site. Keenland 17% on pick 3 and 4's. Retama 12% on Pick 3's. Meadowlands- SUPERFECTA 15% Pick -4 15%. Any Pennsylvania track. takeouas high as 31%. NewYork tracks. 26% takeout on pick 3 and 4's. Suffolk downs 26% on most bets. Fairgrounds 25% on most bets. Gulfstream park 25% takeout on pick 3 and 4's. When the low takeout tracks are running they should be promoted and promoted often. When you talk about NewYork or any other bet with high takeout repeat it and repeat it often. Anytime people go to HANA,TBA,websites,Forums or a Radio shows it should be pointed out constantly so it is in the head of every Horseplayer or person running a race track. We should let it be known that any track with low takeout will be promoted by all of the above. Thank you Anon. Great idea. Note: In early 2009 we will be reviewing tracks in North America here at HANA.